If you want something full of incredible technology besides excellent suspension and chassis, BMW 5-series sedan is the answer. Born in 1972, this executive car is now reached to its seventh-gen, which made its global debut in the first quarter of 2017 and started to arrive in different markets with different variants in the next half of the same year. Compared to the previous iteration, the current generation gets an even sportier look. The BMW 5-series sedan is available in UAE with six different options - 528i, 535i XDrive, 535i, 520i, 550i, 550i XDrive. The top-spec variants such as 550i and 550i XDrive are equipped with 4.0-litre DOHC engine, which is capable of churning out a maximum power of 449 hp, while the peak torque sticks at 650 Nm. On the other hand, a 3.0-litre DOHC engine is provided to the 535i and 535i XDrive models. The engine can make a maximum power of 306 hp and a peak torque of 400 Nm. The 528i and 520i have 2-litre engine that is capable of pushing out a maximum power of 245 hp along with 350 Nm of peak torque. The top-spec variants of BMW 5-series feature central locking, power door locks, Anti-theft alarm, etc in the safety department. Have a question on 5 Series Sedan? 5 Series Sedan is available in 6 different colors - Alpine White, Mediterranean Blue, Black Sapphier, Sophisto Grey Metallic, Blue Stone and Black Carbon. Watch latest video reviews of BMW 5 Series Sedan to know about its interiors, exteriors, performance, mileage and more. Highly regarded as one of the most dynamic to drive business class saloons, the 5-Series sedan is BMW’s answer to Mercedes E-Class and Audi A6. 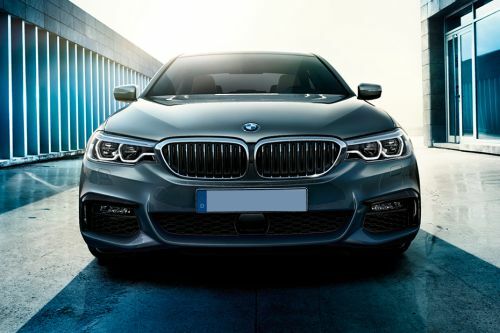 Packed with incredible technologies and blessed with excellent suspension and chassis, the BMW 5-Series offers luxury and sportiness in one great package. The BMW 5-Series is offered in five different variants in the UAE market, apart from the exclusive E-Hybrid variant as well. On the inside too, the overall layout of looks like an evolution of the cabin of the previous generation 5-Series. It does oozes modernity, while at the same time, it is unmistakably a sporty-in-feel BMW cabin in every essence. The instrument console looks simple and sober with analog dials showcased in a wide LCD screen, which looks classy along with a new three-spoke steering wheel with silver finished spokes. The hexagonal shaped center console looks wide – finished in piano black theme, it comprises of buttons for infotainment system and climate control. Talking about the infotainment system, the 5-Series has a pop-up like screen for the infotainment system and also houses various settings for the BMW iDrive system. The 5-Series has always been regarded as a driver’s car, but in this iteration, special attention has been paid to the rear seat comfort as well. To enhance the overall feel, BMW has equipped the cabin with a premium Bowers-&-Wilkins sound system as well. The 5-Series has always been one understated looking car in front of its rivals, and the current generation car continues to be so. While we are not denying the fact that the 5-Series is every bit a premium car just by the way it looks, it certainly lacks a bit of flashiness generally associated with a car of this category. At the front, the 5-Series, like every other BMW, comes blessed with a dual kidney grille, albeit in a slimmer fashion. As seen in other recent BMW sedans, the headlamp clusters are adjoined with the front grille, and comes with full LED lighting assembly. The BMW 5-Series looks elegant from the side view, thanks to the elongated wheelbase of the car. The low sitting stance with large alloy wheels definitely gives it a sportier stance. On the other hand, the prominent lines on the side doors, as well as chrome garnish on the window frames, do give it a character and timeless appeal. At the rear, the BMW 5-Series comes with butterfly-like LED tail lamp clusters, which now look slightly dated after all these years. However, the wide stance and minute chrome garnish do give it a touch of elegance. Complementing the powerful set of engines in the BMW 5-Series is the equally capable suspension setup, which gets a host of technologies to make the overall driving experience much more involving. One does get different driving modes – comfort, eco pro, and sport – to make the overall suspension setup adaptable as per different conditions. There is also a new ‘adaptive’ mode, which adjusts the dynamic damper control as well as steering setup depending upon the suspension settings. BMW is offering this current generation 5-Series sedan in two different petrol engine options. The entry-level 530i comes with a 2.0-litre four-cylinder petrol engine, which puts up 254 PS of power and 350 Nm of torque. Then there is a 3.0-litre six-cylinder petrol engine in the 540i, which produces 343 PS of power and 450 Nm of torque. Both these engines come mated to a common 8-speed automatic gearbox, as well as get both the options of a front wheel drive as well as all-wheel drive in the xDrive variants. The BMW 5-Series is well equipped with all the essential safety features such as six airbags, ABS with EBD and Brake Assist, Lane Departure Warning, Forward Collision Warning, cornering brake control, dynamic traction control and hill start assist. With this latest iteration, BMW has managed to maintain the perfect balance of luxury and dynamism in the 5-Series, as seen in the previous iterations as well. While the overall styling of the 5-Series in and out still remains conservative, the story is entirely different once you crank it off and steer it out. The BMW 5-Series, in that case, still remains one of the best driver’s cars in its category. What are the colors options available in BMW 5 Series Sedan?